Duncan is a Ragdoll-Snowshoe mix. He was adopted by Steve and Leslie in November 1997 when he was about a year and a half old. He's about seven in this photo. Duncan acts dignified most of the time, except when catnip is about, but has become quite affectionate as he grows older. His job twice each day is to lift the lid of the cat food bucket with his nose, and he does it very well. He's come to an uneasy truce with Jeremy, but still makes life difficult for little Keira. Duncan has the most gorgeous blue eyes. 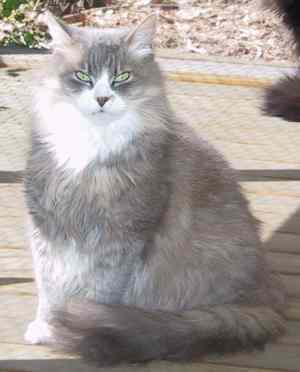 Lacey was a feral cat, adopted by Steve and Leslie in April 1998 when she was about a year old and very skittish. 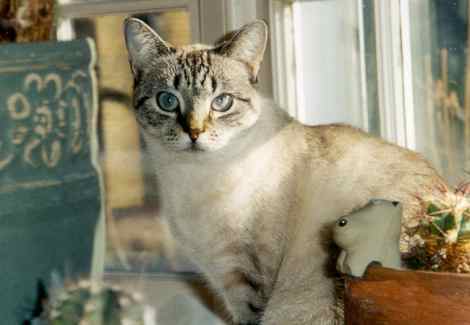 She is a lynx-point Siamese mix and has beautiful blue eyes. Lacey has since become quite the "love bug", making sure she gets her cuddles in the morning and at night, and giving kisses. When she runs, it sounds as if she has several times as many legs as she should, hence her nickname "the Luggage". Lacey is our web site's mascot, adorning the upper left of every page. Lacey passed away on March 27, 2009, after a long illness. Steve and Leslie write, "Our hearts are heavy, but we are grateful to Kitty Angels for bringing us together and for the eleven wonderful years we had with this purry, funny and loving girl." Jeremy looks like a large walking dust-bunny and was adopted by Steve and Leslie in April 1998. One of his nicknames is "Mongo", which pretty much sums up his personality - good-hearted, very strong and not terribly bright. 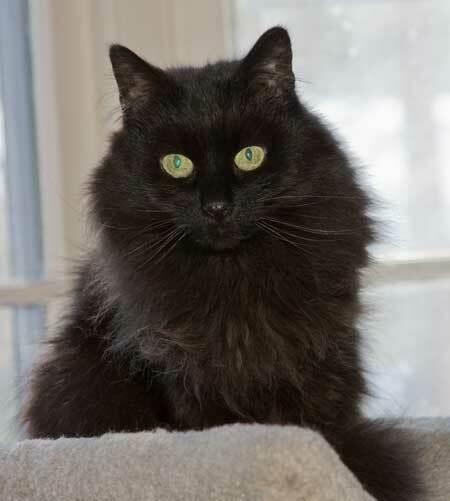 Jeremy is very friendly and affectionate and prefers people-furniture to the cat tree, but he loves laps the best. Steve writes, "I'm sad to say that Jeremy passed away September 29, 2008, after a lengthy illness. Right up to the end he was such a sweet, sweet boy. We miss him, as do Quillan (who considered Jeremy his "best bud") and Keira, but we're comforted in knowing that he had a wonderful ten years with us." Keira was one of several feral kittens found living in a drainpipe. This picture shows her at about ten years old. Jeremy (above) was the "love of her life", but he thought of her more as a "wart" of a little sister, leading to her nickname of "Miss Verruca".. She was adopted in May 1998 by Steve and Leslie.